The Cameron Heights home sale price per square foot has moved to $275 this quarter, and is now $1 over the Edmonton average selling price per square foot. In the past, Cameron Heights tends to stay above or below the Edmonton average for a couple consecutive quarters. 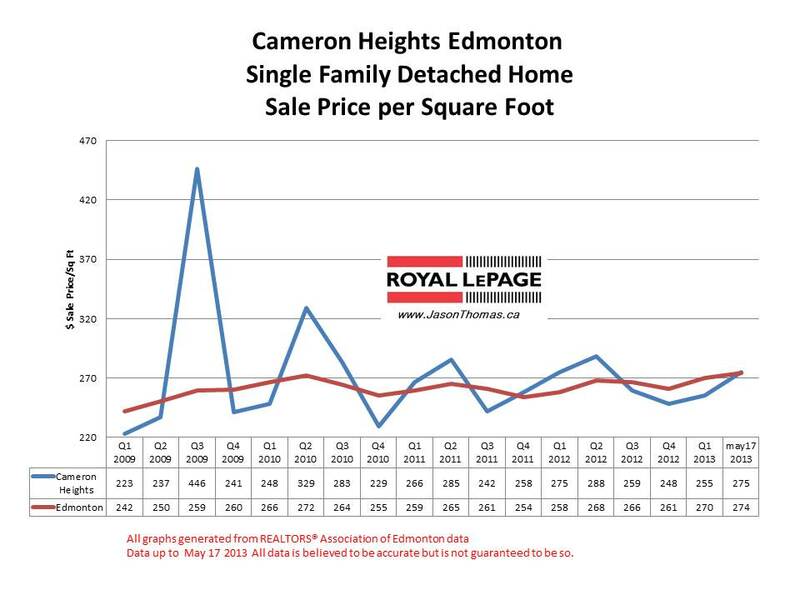 So we should see Cameron Heights continue to stay higher than the Edmonton average over the rest of 2013. The highest sale price for a house in Cameron Heights in the last 12 months was $1,200,000. The average time to sell a home in Cameron Heights in the 2013 has been 58 days. The Edmonton average days on market in 2013 is currently sitting at 43 days.